The importance, which the Bhagawad Gita has in the field of spirituality, the same prominence, and importance has been given to the holy river Ganges in the field of religion and religious activities. No other river has been as much mentioned in the `Purana as the holy Ganges. 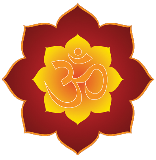 According to the Puranas the Ganges is the holiest of all the shrines on this earth. Not only the man, but even the most mean creatures like insects etc get liberated and achieve salvation. The holy sight of Ganges gives knowledge,Splendours,name,fame etc. The gravest of sins like Brahmhatya (killing of a brahmin) and Gauhatya (killing of a cow) gets absolved by the mere touch of Ganga holy water. Lord Vishnu himself has described the importance of river Ganges in the following way, he says to Garuda. Thousands of man sin gets destroyed by the holy sight of the Ganges, and he becomes pure, by the touch of Ganges water, by having it, or by just pronouncing Ganga-Ganga. For this reason Ganges is also called SANSARTARINI (Saviour of this world). > There are many versions of stories regarding the origin of Ganges. According to the Valmiki Ramayana Ganges was the daughter of Himalaya and Maina. The deities abducted her and took her to heaven. From that time onwards, she started living inside the (a spout shoped vessel). According to Kritivas Ramayana the deities had taken Ganga to Lord Shiva to get her married with him. When Maina did not find her in the house, she cursed her to attain the form of water. > According to another version, king Sagar the descendent of Sun God (Suryavanshi) performed a Yagya in which a horse was set free followed by his sixty thousand sons. Indra, with the motive of destroying the effects of that Yagya and stole that horse and tethered it outside the hermitage of sage Kapila. The sixty thousand sons of Sagar came searching for the horse to the hermitage of Sage Kapila. They started to create nuisance, sage Kapila cursed them and they burnt to ashes. Anshuman another son of king Sagar came searching for his sixty thousand brothers, to Kapila hermitage. When he came to know about the whole story he requested him to tell about the means by which his brothers could attain salvation. Kapila said that his brothers would attain salvation, if the water of Ganga were sprinkled on them. 1) Dwadini, 2) Pavani and 3) Nalini flew towards the east 4) Vakshu, 5) Sita, 6) Sindhu flew towards the west and the seventh stream followed the route, as instructed by Bhagiratha, and hence was called 7) Bhagirathi. Ultimately all the sixty thousand sons of Sagar were liberated by the sprinkle of the water of the Ganga. JANHVI-Another name of the Ganga is Janhvi. > Ganga followed Bhagiratha who was on his chariot. Because of her tremendous speed, all the villages, Forests, etc in the way were either getting submerged or drowned. Sage Jahnu who was doing a yagya in his hermitage got angry when his hermitage was submerged in the Ganga. He drank whole of the Ganga by his yogic power. At this the deities, and the men became restless and they requested Jahnu to release Ganga. Jahnu released Ganga from his thigh by cutting it and for this reason Ganga is also called 'Jahnavi' or 'Jahnusta'. > River Ganges is the longest river in India, The origin of river Ganges lies at the height of 13800 feet in the mountain ranges of Himalayas, in Tehri Garhwal, near Gangotri. > The cave from which river Ganges, originates is called Gomukha,known as Bhagirathi. It is known as Bhagirathi in this region. River Ganges gets water from the melting snow of Nanda devi, Gurla, Mandhata, Dhaulagiri, Gesaisthan, Kanchenjunga and Mount Everest. Many small and big rivers merge with the Ganges in the Himalayan region. > From, the point of her origin up to Badrinath in the eastern region, the Ganges is known as Vishnu Ganga. In the western region it is the Dhaula Gangaof the DronaGiri. Dhaula Ganga merge with Vishnu Ganga near Joshi Math and this combined stream is known as laknanda. After Rudraprayag river Ganges enters Rishikesh and after that she turns toward Haridwar which is situated in south-West direction from Rishikesh. At Allahabad river Yamuna merge with river Ganges. In the ancient times there was also another river named Sarswati which merged at Allahabad , but it has now become extinct. This union of three rivers at Allahabad is also known as Triveni. > After Prayag the Ganges reaches Varanasi. Later on this river Gomati merge with the Ganges. 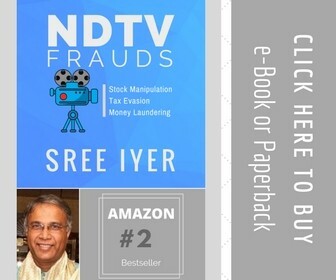 After that the Ganges enters the state of Bihar. Near Patna river Gandaki coming from Nepal also merge into the Ganges. One stream is known as 'Hughli' and ultimately merges into the 'Bay of Bengal'. > The Ganges travels a distance of 1557 miles beginning from the point of origin till she ultimately merge into the ocean. > Which countries, which provinces, which retreats, which mountains, and which rivers, O grandsire, are the foremost in point of sanctity? > Bhishma said: In this connection is cited the old narrative of a conversation between a Brahmana in the observance of the Sila and Unccha vows, O Yudhishthira, and a Rishi crowned with ascetic success. > Meeting with each other and seated at their ease, the two began to converse on agreeable subjects connected with the Vedas and the Upanishads. Towards the conclusion of the discourse, the Brahmana in the observance of the Sila vow respectfully addressed the Rishi crowned with success. Endued with intelligence, he put this very question which thou, O Yudhishthira, hast put to me. > The poor Brahmana said: What countries, what provinces, what retreats, what mountains, and what rivers should be regarded as the foremost in point of sanctity? Do thou discourse to me on this. > The Rishi crowned with success said: Those countries, those provinces, those retreats, and those mountains, should be regarded as the foremost in point of sanctity through which or by the side of which that foremost of all rivers, viz., Bhagirathi (Ganga or Ganges) flows. 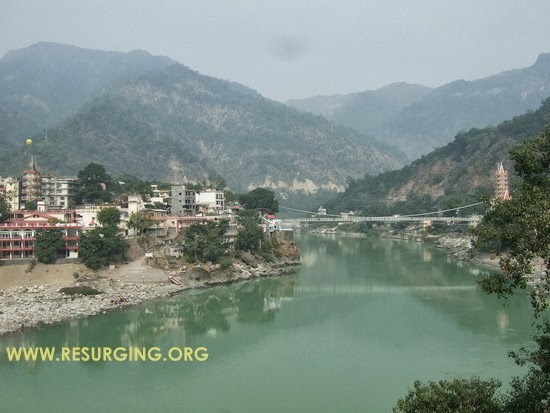 That end which a creature is capable of attaining by penances, by Brahmacharya (practising celibacy), by sacrifice, or by practising renunciation, one is sure to attain by only living by the side of the Bhagirathi (river Ganges) and bathing in its sacred waters. > Those creatures whose bodies have been sprinkled with the sacred waters of Bhagirathi or whose bones have been laid in the channel of that sacred stream, have not to fall away- from heaven at any time. Those men, O learned Brahmana, who use the waters of Bhagirathi (Ganga) in all their acts, surely ascend to heaven after departing from this world. Even those men who, having committed diverse kinds of sinful deeds in the first part of their lives, betake themselves in after years to a residing by the side of Ganga, succeed in attaining to a very superior end. Hundreds of sacrifices cannot produce that merit which men of restrained souls are capable of acquiring by bathing in the sacred waters of Ganga. > A person is treated with respect and worshipped in heaven for as long a period as his bones lie in the channel of the Ganga. Even as the Sun, when he rises at the dawn of day, blazes forth in splendour, having dispelled the gloom of night, after the same manner the person that has bathed in the waters of Ganga is seen to shine in splendour, cleansed of all his sins. > Those countries and those points of the compass that are destitute of the sacred waters of Ganga are like nights without the moon or like trees without flowers. Verily, a world without Ganga is like the different orders and modes of life when they are destitute of righteousness or like sacrifices without Soma. Without doubt, countries and points of the compass that are without Ganga are like the firmament without the Sun, or the Earth without mountains, or the welkin without air. The entire body of creatures in the three worlds, if served with the auspicious waters of Ganga, derive a pleasure, the like of which they are incapable of deriving from any other source. > He who drinks Ganga water that has been heated by the Suns rays derives merit much greater than that which attaches to the vow of subsisting upon the wheat or grains of other corn picked up from cowdung. It cannot be said whether the two are equal or not, viz., he who performs a thousand Chandrayana rites for purifying his body and he who drinks the water of Ganga. It cannot be said whether the two are equal or not, viz., one who stands for a thousand years on one foot and one who lives for only a month by the side of Ganga. One who lives permanently by the side of Ganga is superior in merit to one who stays for ten thousand Yugas with head hanging downwards. As cotton, when it comes into contact with fire, is burnt off without a remnant, even so the sins of the person that has bathed in Ganga become consumed without a remnant. There is no end superior to Ganga for those creatures who with hearts afflicted by sorrow, seek to attain to ends that may dispel that sorrow of theirs. > As snakes become deprived of their poison at the very sight of Garuda (eagle), even so one becomes cleansed of all ones sins at the very sight of the sacred stream of Ganga. They that are without good name and that are addicted to deeds of sinfulness, have Ganga for their fame, their protection, their means of rescue, their refuge or cover. Many wretches among men, who become afflicted with diverse sins of a heinous nature, when they are about to sink into hell, are rescued by Ganga in the next world (if, notwithstanding their sins, they seek the aid of Ganga in their after-years). They, O foremost of intelligent men, who plunge every day in the sacred waters of Ganga, become the equals of great Munis and the very deities with Vasva at their head. Those wretches among men that are destitute of humility or modesty of behaviour and that are exceedingly sinful, become righteous and good, O Brahmana, by betaking themselves to the side of Ganga. As Amrita (drink that confers immortality) is to the deities, a Swadha (oblation offered to Pitris during sacred fire ceremony) is to the Pitris, as Sudha is to the Nagas, even so is Ganga water to human beings. > As children afflicted with hunger solicit their mothers for food, after the same manner do people desirous of their highest good pay court to Ganga. As the region of the self-born Brahma is said to be foremost of all places, even so is Ganga said to be foremost of all rivers for those that desire to bathe. As the earth and the cow are said to be the chief sustenance of the deities and other celestials, even so is Ganga the chief sustenance of all living creatures. > As the deities support themselves upon the Amrita (drink of immortality) that occurs in the Sun and the Moon and that is offered in diverse sacrifices, even so do human beings support themselves upon Ganga water. One besmeared with the sand taken from the shores of Ganga regards himself as a denizen of heaven, adorned with celestial unguents. He who bears on his head the mud taken from the banks of Ganga presents an effulgent aspect equal to that of the Sun himself bent on dispelling the surrounding darkness. When that wind which is moistened with the particles of Ganga-water touches ones person, it cleanses him immediately of every sin. A person afflicted by calamities and about to sink under their weight, finds all his calamities dispelled by the joy, which springs up in his heart at the sight of that sacred stream. > By holding that sacred stream, touching it, and bathing in its waters, one rescues ones ancestors to the seventh generation. > By the melody of the swans and kokas and other aquatic fowls that play on her breast, Ganga challenges the very Gandharvas (celestial singers and musicians) and by her high banks the very mountains on the Earth. Beholding her surface teeming with swans and diverse other aquatic fowls, and having banks adorned with pasturelands with cows grazing on them, Heaven herself loses her pride. The high happiness, which one enjoys by a residence on the banks of Ganga, can never be his who is residing even in heaven. I have no doubt in this that the person who is afflicted with sins perpetrated in speech and thought and overt act, becomes cleansed at the very sight of Ganga. By holding that sacred stream, touching it, and bathing in its waters, one rescues ones ancestors to the seventh generation, ones descendants to the seventh generation, as also other ancestors and descendants. By hearing of Ganga, by wishing to repair to that river, by drinking its waters, by touching its waters, and by bathing in them a person rescues both his paternal and maternal races. By seeing, touching, and drinking the waters of Ganga, or even by applauding Ganga, hundreds and thousands of sinful men became cleansed of all their sins. They who wish to make their birth, life and learning fruitful, should repair to Ganga and gratify the Pitris and the deities by offering their oblations of water (tarpan). > The merit that one earns by bathing in Ganga is such that the like of it is incapable of being earned through the acquisition of sons or wealth or the performance of meritorious acts. > Those who, although possessed of the physical ability, do not seek to have a sight of the auspicious Ganga of sacred current, are, without doubt, to be likened to persons afflicted with congenital blindness or those that are dead or those that are destitute of the power of locomotion through palsy or lameness. What man is there that would not reverence this sacred stream that is adored by great Rishis conversant with the Present, the Past, and the Future, as also by the very deities with Indra at their head. What man is there that would not seek the protection of Ganga whose protection is sought for by forest recluses and householders, and by Yatis and Brahmacharins alike? > That man who dwells by the side of Ganga up to the time of his death, adoring her with reverence, becomes freed from the fear of every kind of calamity, of sin, and of kings. The man of righteous conduct who, with rapt soul, thinks of Ganga at the time when his life-breaths are about to leave his body, succeeds in attaining to the highest end. > When that highly sacred stream fell from the firmament, Maheswara held it on His head. It is that very stream which is adored in heaven. [Note: The river Ganga has three courses. On Earth it is called Bhagirathi or Ganga; in heaven it is called Mandakini; and in the nether region it is known by the name of Bhogavati. The three regions, viz., (Earth, Heaven, and the nether place called Patala) are adorned by the three courses of this sacred stream. The man who uses the waters of that stream becomes certainly crowned with success. As the solar ray is to the deities in heaven, as Chandramas is to the Pitris, as the king is to human beings, even such is Ganga unto all streams. One who becomes bereaved of mother or father or sons or spouses or wealth does not fell that grief which becomes ones, when one becomes bereaved of Ganga. One does not obtain that joy through acts that lead to the region of Brahma, or through such sacrifices and rites that lead to heaven, or through children or wealth, which one obtains from a sight of Ganga. The pleasures that men derive from a sight of Ganga is equal to what they derive from a sight of the full moon. That man becomes dear to Ganga who adores her with deep devotion, with mind wholly fixed upon her, with a reverence that refuses to take any other object within its sphere, with a feeling that there is nothing else to the universe worthy of similar adoration, and with a steadiness that knows no failing away. > Creatures that live on Earth, in the welkin, or in heaven- indeed, even beings that are very superior- should always bathe in Ganga. Verily, this is the foremost of all duties with those that are righteous. The fame of Ganga for sanctity has spread over the entire universe, since she bore all the sons of Sagara, who had been reduced to ashes, from here to heaven. [Note: The story referred to is this: King Sagara of the Solw race had sixty thousand sons, all of whom were reduced to ashes by the curse of Kapila. Afterwards Bhagiratha, a prince of the same race, brought down Ganga from heaven for their redemption. > Men who are washed by the bright, beautiful, high, and rapidly moving waves of Ganga, raised by the wind, became cleansed of all their sins and resemble in splendour the Sun with his thousand rays. Those men of tranquil souls that have cast off their bodies in the waters of Ganga, whose sanctity is as great as that of the ghee (clarified butter) and other liquids poured in sacrifices and which are capable of conferring merits equal to those of the greatest of sacrifices, have certainly attained to a station equal to that of the very deities. Verily, Ganga, possessed of fame and vast extent and identical with the entire universe and reverenced by the deities with Indra at their head, the Munis and human beings, is competent to bestow the fruition of all their wishes upon them that are blind, them that are idiots, and them that are destitute of all things. > They that sought the refuge of Ganga, that protectress of all universe, that flows in three streams, that is filled with water at once highly sacred and sweet as honey and productive of every kind of good, have succeeded in attaining to the beatitude of heaven. 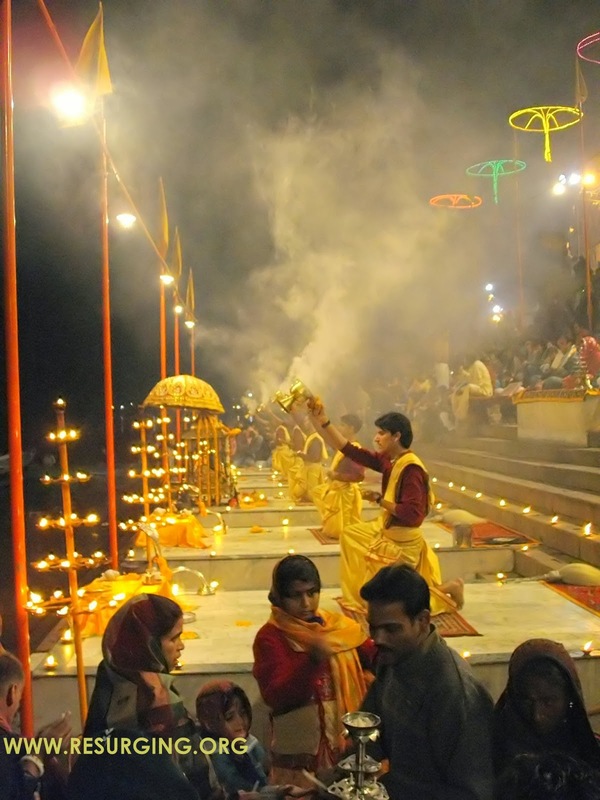 That mortal who dwells by the side of Ganga and beholds her every day, becomes cleansed by her sight and touch. Unto him the deities give every kind of happiness here and a high end hereafter. Ganga is regarded as competent to rescue every creature from sin and lead him to the felicity of heaven. She is held to be identical with Prisni, the mother of Vishnu. She is identical with the Word or Speech. She is very remote, being incapable of easy attainment. She is the embodiment of auspiciousness and prosperity. She is capable of bestowing the six well-known attributes beginning with lordship or puissance. She is always inclined to extend her grace. She is the displayer of all things in the universe, and she is the high refuge of all creatures. Those who have sought her protection in this life have surely attained heaven. The fame of Ganga has spread all over the welkin, and heaven, and earth, and all the points, cardinal and subsidiary, of the compass. Mortal creatures, by using the waters of that foremost of streams, always become crowned with high success. That person who himself beholding Ganga, points her out to others, finds that Ganga rescues him from rebirth and confers Emancipation on him. Ganga held Guha, the generalissimo of the celestial forces, in her womb. She bears the most precious of all metals, viz., gold, also in that womb of hers. They who bathe in her waters every day in the morning succeed in obtaining the aggregate of three, viz., Righteousness, Wealth and Pleasure. Those waters are, again, equal in point of sanctity to the ghee that is poured with Mantras on the sacrificial fire. Capable of cleansing one from every sin, she has descended from the celestial region, and her current is held in high esteem by every one. > Ganga is the daughter of Himavat, the spouse of Hara, and the ornament of both heaven and earth. She is the bestower of everything auspicious, and is competent to confer the six well-known attributes beginning with lordship or puissance. Verily, O king, Ganga is the one object of great sanctity in the three worlds and confers merit upon all. Truly, monarch, Ganga is Righteousness in liquefied form. She is energy also running in a liquid form over the earth. She is endued with the splendour of puissance that belongs to the ghee that is poured with Mantras on the sacrificial fire. She is always adorned with large waves as also with Brahmanas who may at all times be seen performing their ablutions in her waters. Falling from heaven, she was held by Siva on his head. The very mother of the heavens, she has sprung from the highest mountain for running over the plains and conferring the most precious benefits on all creatures of the earth. She is the highest cause of all things; she is perfectly stainless. She is as subtle as Brahma. > She affords the best bed for the dying. She leads creatures very quickly to heaven. She bears away a large volume of water. She bestows great fame on all. She is the protectress of the universe. She is identical with every form. She is very much coveted by persons crowned with success. Verily, Ganga is the path to heaven of those that have bathed in her current. The Brahmanas hold Ganga as equaling the earth in forgiveness, and in the protection and upholding of those that live by her; further, as equaling Fire and Surya (Sun) in energy and splendour; and, lastly, as always equaling Guha himself in the matter of showing favours unto the regenerate class. > Those men who, in this life, even mentally seek with their whole souls that sacred stream which is praised by the Rishis, which has issued out of the feet of Vishnu, which is very ancient, and which is exceedingly sacred, succeed in repairing to the regions of Brahman. Fully convinced that children and other possessions, as also regions possessed of every kind of felicity, are transitory or liable to destruction, men of subdued souls, who are desirous of attaining to that everlasting station which is identical with Brahma, always pay their adorations to Ganga with that reverence and love which are due from a son to mother. The man of cleansed soul who is desirous of achieving success, should seek the protection of Ganga who is like a cow that yields Amrita (drink that confers immortality) instead of ordinary milk, who is prosperity itself, who is possessed of omniscience, who exists for the entire universe of creatures, who is the source of all kinds of food, who is the mother of all mountains, who is the refuge of all righteous persons, who is immeasurable in puissance and energy, and who charms the heart of Brahma himself. > Having with austere penances, gratified all the deities with the Supreme Lord (Vishnu), Bhagiratha brought Ganga down to earth. Repairing unto her, men always succeed in freeing themselves from every kind of fear both here and hereafter. Observing with the aid of intelligence, I have mentioned to thee only a small part of the merits of Ganga. My power, however, is inadequate to speak of all the merits of the sacred river, or, indeed, to measure her puissance and sanctity. One may, by putting forth ones best powers, count the stones that occur in the mountains of Meru or measure the waters that occur in the ocean, but one cannot count all the merits, which belong to the waters of Ganga. > Hence, having listened to these particular merits of Ganga, which I have uttered with great devotion, one should, in thought, word and deed, reverence them with faith and devotion. In consequence of thy having listened to those merits which I have recited, thou art sure to fill all the three regions with fame and attain to a measure of success that is very large and that is difficult of being attained to by any other person. Verily, thou shalt, soon after that, sport in joy many a region of great felicity created by Ganga herself for those that reverence her. Ganga always extends her grace unto those that are devoted to her with humbleness of heart. She unites those that are devoted to her with every kind of happiness. I pray that the highly blessed Ganga may always inspire thy heart and mine with such attributes as are fraught with righteousness. > Bhishma continued: The learned ascetic endued with high intelligence and great illumination, and crowned with success, having in this manner discoursed unto that poor Brahmana in the observance of the Sila vow, on the subject of the infinite merits of Ganga, then ascended the firmament. The Brahmana in the observance of Sila vow, awakened by the words of that ascetic crowned with success, duly worshipped Ganga and attained to high success. Do thou also, O son of Kunti, seek Ganga with great devotion, for thou shalt then, as the reward thereof, attain to high and excellent success. > Vaisampayana continued: Hearing this discourse from Bhishma that was fraught with the praise of Ganga, Yuthishthira with his brothers became filled with great delight. That person who recites or hears recited this sacred discourse fraught with the praise of Ganga, becomes cleansed of every sin.